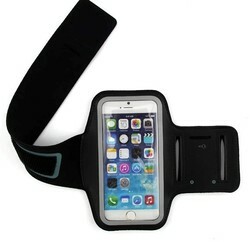 You won't have to worry about damage to your phone when you take this for a run! This athletic armband fits the Samsung Galaxy Note and other smaller devices as well. Item is 21" from end to end. Wrap the polyester / spandex material around your arm and sit your smartphone inside to plug into to tunes and keep a track of your fitness goals. This is a great way to get on the good side of exercising clients. Just imprint this with your customer's logo to pump up the next marketing campaign!